A militant group linked to former Palestinian governing party Fatah has threatened to kill leaders of political rival Hamas. The al-Aqsa Martyrs Brigades said it held Hamas officials responsible for deaths during violent clashes between gunmen from both factions. Three senior Hamas officials had been marked out for "execution", a statement from the group said. 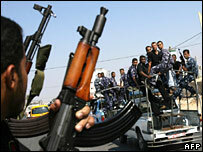 Clashes between gunmen from the two rival groups began on Sunday in Gaza. Eight people died and more than 60 were injured. Two more people died on Monday in further clashes. The latest violence is believed to mark the most serious round of internecine fighting since Hamas came to power in March, having crushed Fatah in January elections. The Palestinian Authority President, Mahmoud Abbas, and the Hamas Prime Minister, Ismail Haniya, have appealed for calm and said the violence must stop. "We in al-Aqsa announce, with all might and frankness... [that we will] execute the head of the sedition, Khaled Meshaal, Said Siyam and Youssef al-Zahar, and we will execute this ruling so those filthy people can be made an example," the statement from the al-Aqsa group said. Mr Meshaal is Hamas's Damascus-based political chief, Mr Siyam the interior minister and Mr Zahar a senior interior ministry official. Hamas legislator Mushir al-Masri accused the group of "pouring oil on the fire". Hamas would "not show mercy" if its top leaders were targeted, Reuters news agency quoted him as saying. His comments came as Fatah-allied gunmen forced several schools in Gaza to close and blocked a crossing in central Gaza with a protest, the Associated Press news agency reported. The clashes have been triggered by Hamas' inability to pay the wages of government workers. Western aid payments to the Hamas-led Palestinian government ceased earlier this year over the militant group's refusal to renounce violence and recognise Israel. Civil servants, including security forces loyal to the Fatah faction, have been protesting about not receiving full salaries, and the armed clashes were sparked when the Hamas militia in Gaza moved in to end the protests. 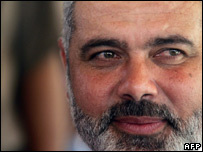 Mr Haniya and Mr Abbas have also been locked in an increasingly bitter power struggle. The two have been trying unsuccessfully to form a unity government. This week Mr Abbas is due to meet US Secretary of State Condoleezza Rice, who is visiting the region in an effort to restart peace talks between Israel and the Palestinians. Tuesday saw one Palestinian die and another injured in an Israeli air strike on a foundry in southern Gaza, residents told Reuters news agency. A spokesman for the Israeli army said the strike had targeted a suspected weapons factory.